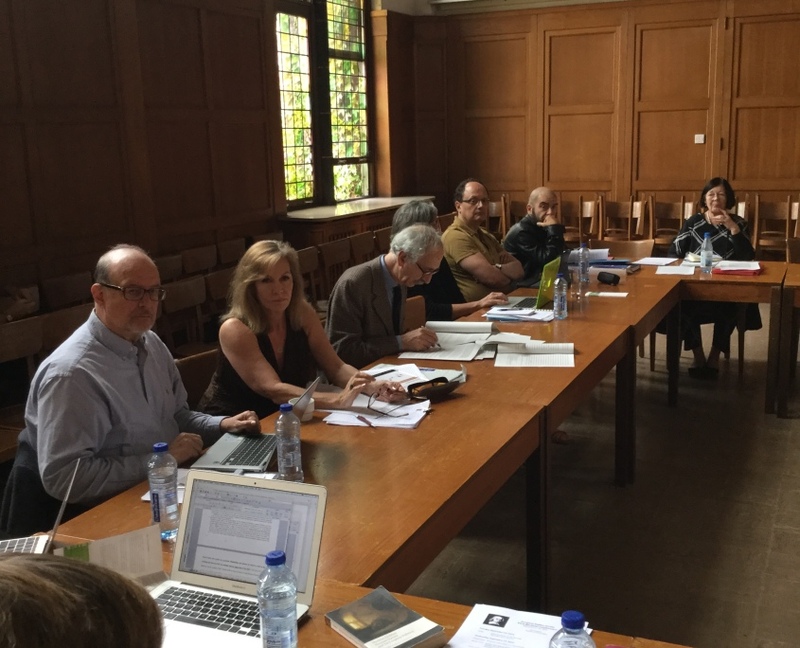 Papers are invited on any aspect of Hobbes’s philosophy for discussion at a meeting of the European Hobbes Society to be held 27-28 April at the European University Institute, Florence, under the auspices of the Max Weber Programme. Keynote lecture: Alan Cromartie, University of Reading, ‘The Hobbesian project: science, politics, and worship’. Five minutes for the author to introduce their paper. It is assumed that those attending have read the paper in advance. A short (five-ten minutes) response from an allocated respondent. Brief opportunity for the author to reply. If you would like to present a paper, please send a title and a short abstract (no more than 250 words) by Monday 27th February to alexandra.chadwick@eui.eu. We ask that papers are ready for circulation by Friday 14th April to enable attendees to read them in advance. Unfortunately, we are unable to cover the expenses of those presenting papers at the workshop. The call for papers is available as a PDF here. Hobbes Studies is pleased to invite submissions to the Hobbes Studies Essay Competition 2017. 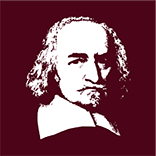 Submissions should treat the philosophical, political historical, literary, religious, or scientific aspects of the thought of Thomas Hobbes and be no more than 10 000 words. Essays are invited from researchers in any field who are currently enrolled in postgraduate study or completed their PhD no earlier than 3rd March 2012. Submissions must be received by 3rd March 2017. The judges reserve the right not to make an award. All submissions should be uploaded to the journal’s Editorial Manager website: http://www.editorialmanager.com/hobs/default.aspx. When submitting your manuscript for consideration, please note in the comments box that you desire to be considered for the 2017 competition (immediately before uploading the files), and include your CV. Submissions must follow Hobbes Studies submission guidelines. For questions, please email the Assistant Editor at hobbestudies@gmail.com. Essays must not have been previously published or simultaneously submitted for consideration elsewhere. Submissions will be considered for publication in a forthcoming issue of Hobbes Studies. The winning essay will be awarded 350 euros, a year’s subscription to the journal and be published in Hobbes Studies. 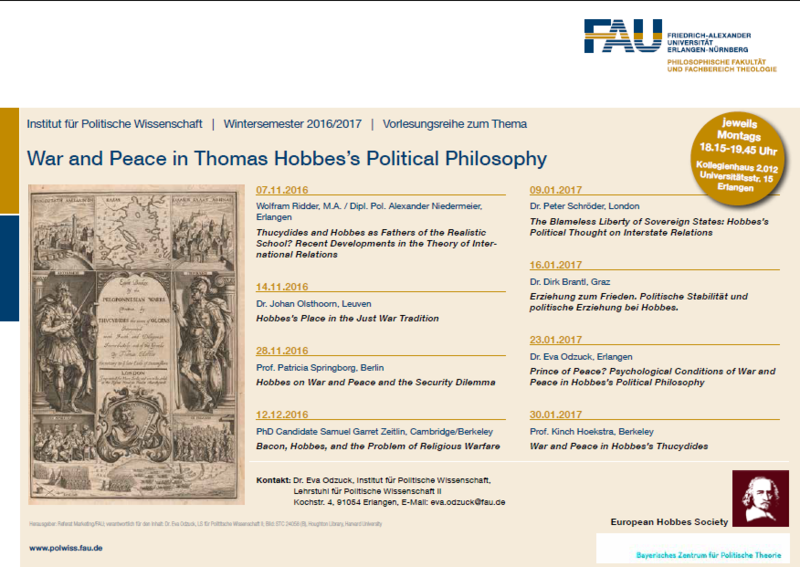 A lecture series on “War and Peace in Hobbes’s Political Philosophy” will take place at the University of Erlangen-Nürnberg, Kollegienhaus KH. 2.012, Universitätsstraße 15, 91054 Erlangen, Germany. 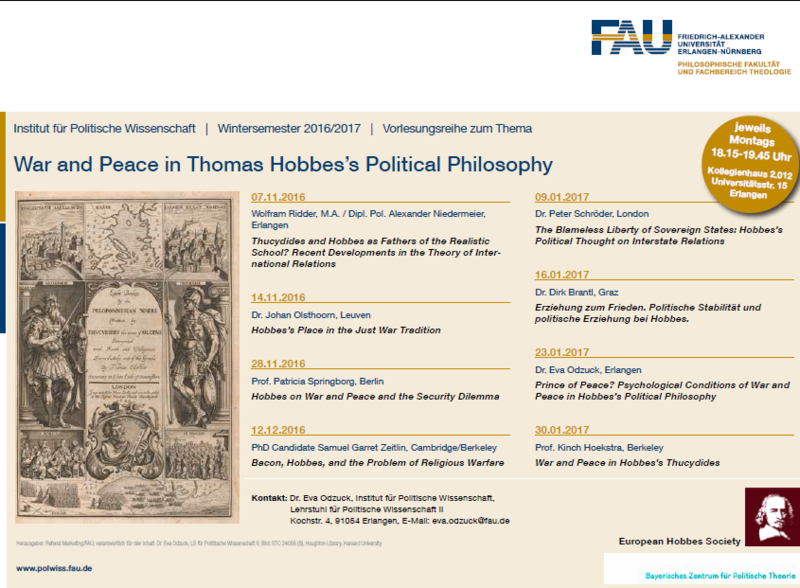 In eight lectures, international experts (including Kinch Hoekstra, Peter Schröder and Patricia Springborg) alongside younger scholars will discuss Thomas Hobbes’s political philosophy and his notions of war and peace. Is Hobbes a “Prince of Peace”? Is the title of “realist” correct to describe the complexity of his political philosophy? What kind of peace can we find in Hobbes, and what are its psychological preconditions? What kind of arguments and literary techniques does Hobbes use for his philosophical and his political goals? Is his translation of Thucydides a mere translation? Attendance is free but registration is recommended. You are welcome to attend only some of the lectures. If you would like to join us for dinner after a lecture, please let us know, so that we can adjust our reservations. For any further questions please contact Eva.Odzuck@fau.de. Please find all information in this pdf. 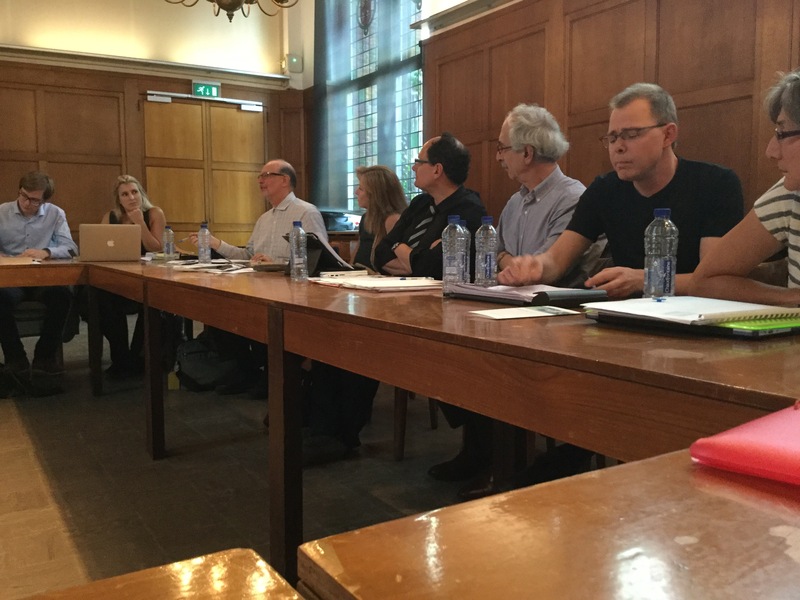 From 20-22 Sept 2016, 25 scholars, based in 10 different countries, came together in the cosy college town of Leuven, Belgium, for the first biennial conference of the European Hobbes Society. It was a joy to see quite a few new faces amidst many familiar ones. With much judgment and wit, and some fancy, we discussed ten new papers, covering a range of aspects of Hobbes’s thought. The two splendid keynote speeches were delivered by Deborah Baumgold and S.A. Lloyd. While our academic discussions have not quite ended, at the conference, a resolute and final sentence was cast on our constitution, which was judiciously adopted by universal acclaim. The full program can be found here. We are very grateful to the magnanimous Fritz Thyssen Stiftung for having made possible this conference. Thanks also goes out to all participants, both for the fine social and intellectual virtues which they have brought to bear on the event, and for helping us relocate the conference to KU Leuven at short notice. As the title of the conference boldly announced, we aspire to organise a larger conference every two years. We look forward to setting up smaller workshops, panels, and lectures series in the meantime, and we much encourage and support you to do the same. Our dialogue has not concluded, it has merely been interrupted. 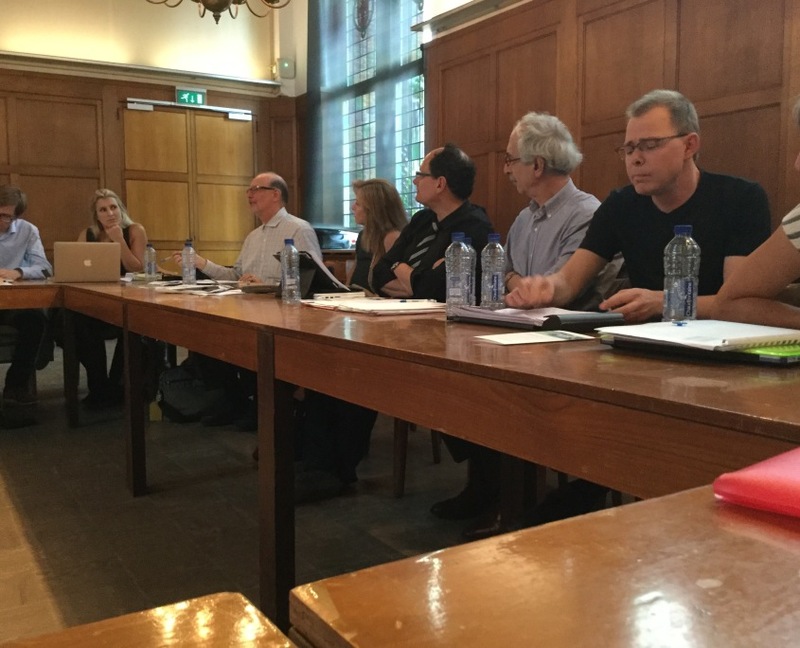 The first EHS biennial conference has been relocated and will now take place on Wednesday 21 and Thursday 22 September, at the Institute of Philosophy, KU Leuven, Belgium. It promises to be an exciting event: the programme (here) includes papers by Patricia Springborg, Luc Foisneau, Deborah Baumgold, Peter Schröder, Agostino Lupoli, and S.A. Lloyd. Attendance at the conference is free but registration is required. Please email Johan Olsthoorn (johan.olsthoorn@kuleuven.be) to register or for any further information. 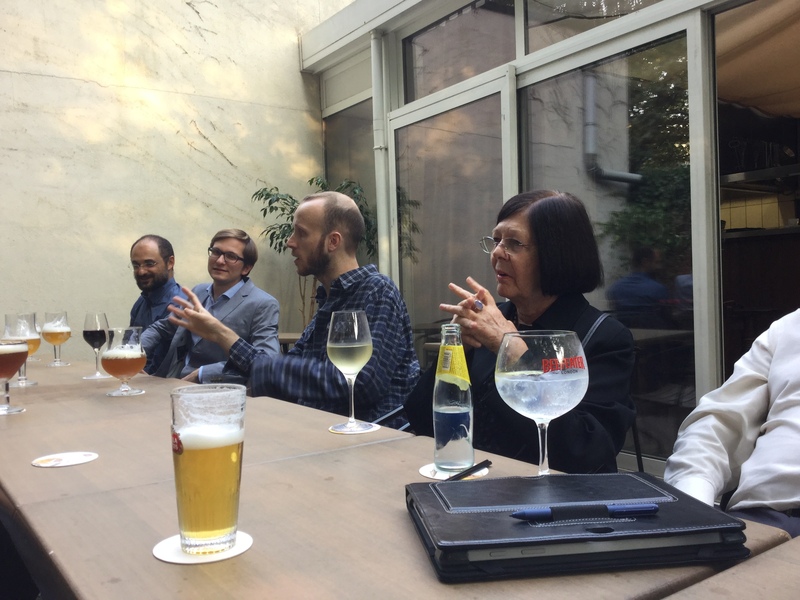 The organisers are pleased to gratefully acknowledge the generous support of the Fritz Thyssen Foundation for making possible this event. 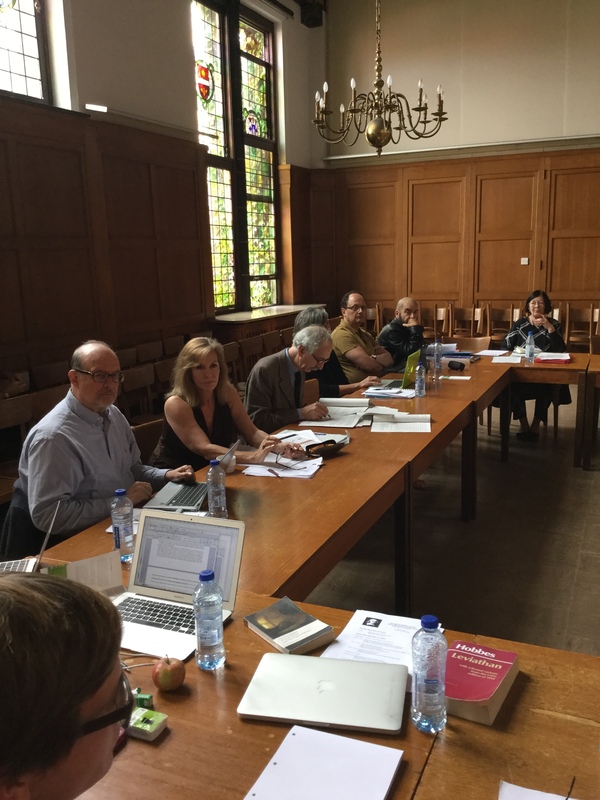 ‘Thomas Hobbes and the Politics of Religion’ is the inaugural research project of the European Hobbes Society. It examines the relation between Hobbes’s political and religious thought, and, in particular, the various strategies he devised for overcoming the threats to social and political stability posed by religion. See here for more information. The project comprises two workshops. The first was held at King’s College London in April 2015, and featured some exceptional papers by a mix of seasoned Hobbes experts and some of the most exciting up-and-coming young scholars in the field (programme here). The second workshop will be held at Leiden University College, The Hague, in September 2015, and the programme is looking just as impressive (programme here). We plan to publish a collected volume following the two workshops … so hopefully there will be more news about this before too long.